Now you can hear the way pirate radio use to sound in the 1980's! Since pirate radio ended in the early 1990's Alan Sane and Ivan Jefferies wanted to continue the fun and craziness of pirate radio. The only way this could be done was to air their show on rni, radio New York International. 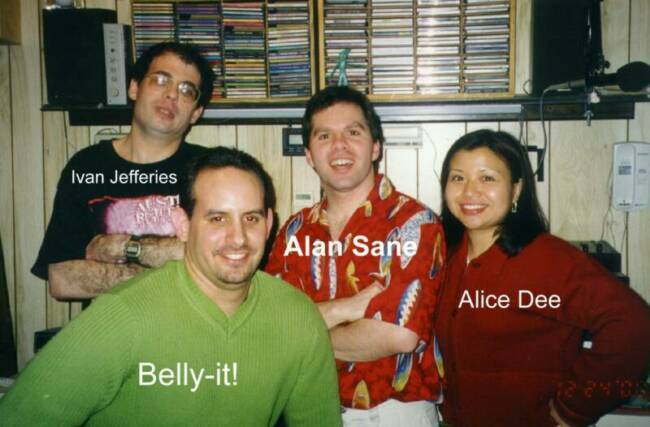 Listen in to the Alan Sane Show and you will hear insults and bashing from Alan Sane. You can read about how much I bash Ivan by going to RNI on the Internet. You can have the good fortune of hearing Alan sane insult Ivan Jefferies. This is not an act! Ivan doesn't know what I am gonna say about him nor do I have any idea as to how he will retalliate. If this isn't enough, we play music - mostly from the 70's and 80's. However, I'm flexible as to the music I play. Basically, I do a show the same way as when I had my popular pirate radio show, WMAD. Depending upon my mood, I occasionally have Ivan Jefferies or belly-it as sidekicks. As previously mentioned, my side kick is based upon my mood - and I can be very moody! We attempt to make the show as comical and entertaining as humanly possible. So check it out,everyday around 7:00pm EST at www.11l-rni.com, and enjoy the show! If you have any questions or comments pertaining to the music and/or programming, please send me an e-mail..
At 12:00pm, you have Pirate Radio WMAD in Brooklyn with a 17 year old Alan sane will be airing at 12:00pm EST. You can hear how Alan sane did pirate radio back in the 1980's. These are live airchecks with people calling in for request. All shows are played at random and all shows were edited. Shows are being added weekly. The Alan Sane Show! .